Travelling on public holidays has its downsides. Most of the museums were closed, and I basically spent the afternoon walking the streets and popping into one church after another. 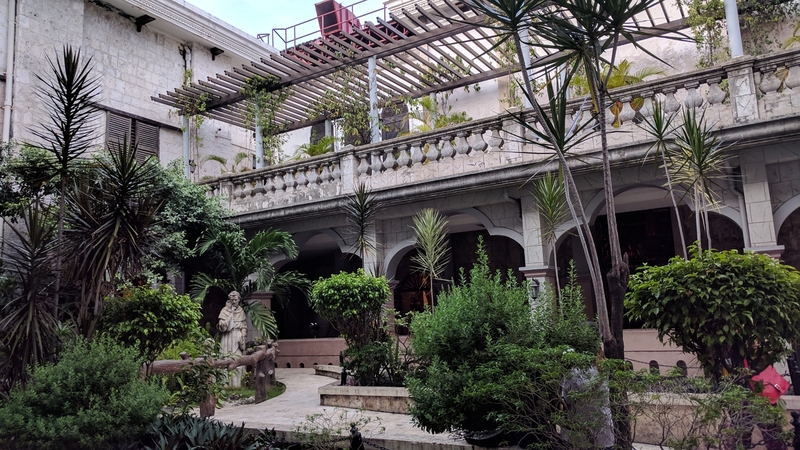 My original plan was The Yap-Sandiego House, Casa Gorordo, Jesuit House, Cathedral Museum, and maybe other sights along the way. What happened was ‘other sights’ became the main agenda. After walking outside the first three destinations (and popping into the Ancestral House), I ended up at the Heritage of Cebu monument. I decided to have a closer look only because there were swathes of Chinese tourists around it. It was, in some respects, remarkable. Designed and sculpted by local artist Eduardo Castillo, the monument depicts interesting scenes from Cebu’s history. After taking a few snaps, I decided to try my luck with the Cathedral Musuem a few blocks down. Unfortunately, the museum was closed, but the neighbouring cathedral was – as usual – open to all. I’ve seen many churches across the Philippines, and I was prepared to be underwhelmed. Yet something about the cathedrals and basilicas in Cebu left me appreciate sacred architecture once again. I got to Cebu Cathedral in the middle of an afternoon mass, and felt it inappropriate to take photos of the interiors. I loved the choir loft / balconies that wrapped around the nave – something I have not seen in any Spanish-era church. Unfortunately, stairwells were gated and locked, so I need to rely on my imagination for views from the top. Nevertheless, the whitewashed Cebu Cathedral was charming in its own right. 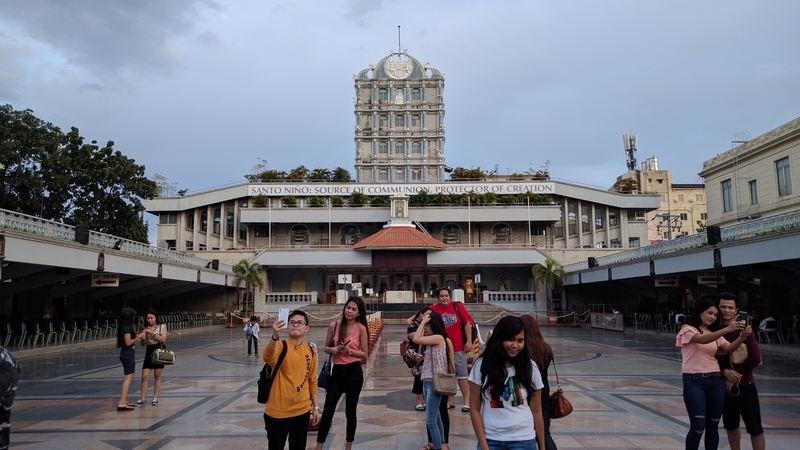 A few blocks away was the Basilica de Santo Niño (Child Jesus) and an attached college by the same name. The church itself under restoration, but the real gem was the inner courtyard between the church and the offices (which I think used to be the monastery). 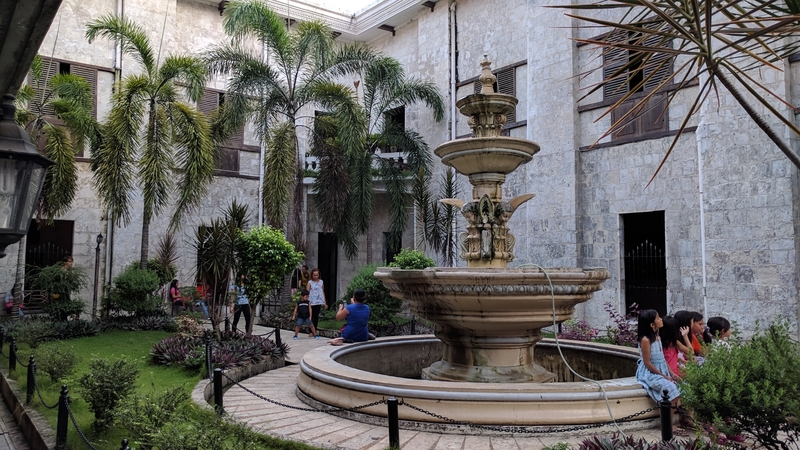 The courtyard ​was small and filled with people, mostly tourists. But even in its populated state, it had an odd charm that lended a sense of serenity. It made me want to linger and contemplate. It is quite likely that one can find some semblance of peace in this small patch of earth. The space reminded me of the Cloisters in New York, albeit much smaller and more crowded. Even then, I can easily imagine myself spending an hour here, in deep conversation with God, hearing the fountain in the background. Perhaps the most unique aspect of this basilica complex is the large plaza outdoors. I imagine a packed area on Sundays or special days of celebration (Christmas or Easter). It reminds me of the plaza outside the Vatican – only less dramatic and picturesque. Apparently, this is a popular site for pilgrimages, and a Pilgrim’s Center was built acorss the plaza, facing the church’s a main entrance. The plaza was actually built a to accommodate the hordes of devotees who wish to hear mass at the historic site. 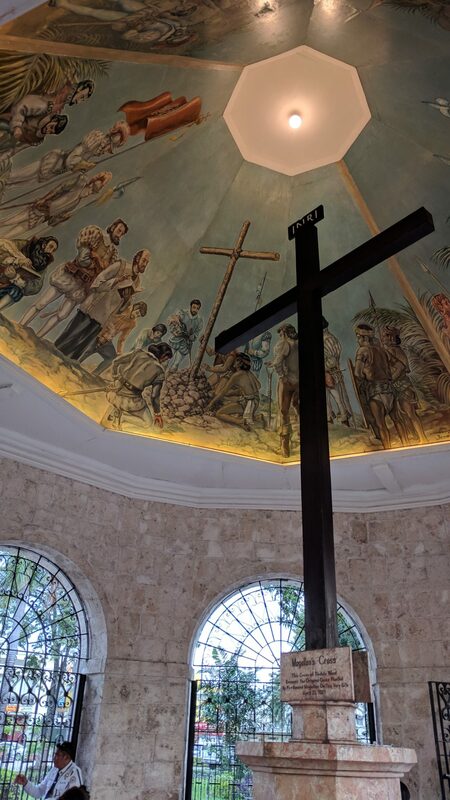 Exiting through the south of the basilica complex, I found myself at the well-known Magellan’s Cross. It looked exactly the way it did when I first saw it over ten years ago. Major historic landmark visit – check. Near Magellan’s Cross is the BPI Museum, which was – as expected – closed. As was the museum inside the Pilgrim’s Center of the Santo Niño basilica. So I crossed back to the main road to ride a jeepney back to my accommodations, and called it a day. Next PostNext Stand and Fall.